The story delves into the challenges in the life of a couple in America, who are in fact two highly trained soviet intelligence agents deployed there to acquire vital information. Where can you stream The Americans? On 2013-01-30 Crime/Drama TV Series The Americans first aired on FX. 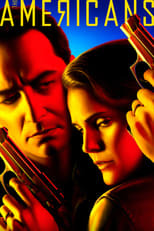 Written and created by Joseph Weisberg, and produced by DreamWorks Television, The Americans has ended and last broadcasted on 2018-05-30.